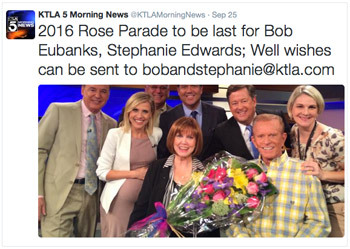 LOS ANGELES, Calif. (Sept. 25, 2015)  Bob Eubanks and Stephanie Edwards have announced that after thirty-eight and thirty-five years (respectively) as hosts of the KTLA Rose Parade broadcast, the 2016 Tournament of Roses Parade will be their last. "KTLA is profoundly grateful to Bob Eubanks and Stephanie Edwards for their incredible dedication to this television station," KTLA President/General Manager Don Corsini said. "Bob and Steph are valued members of our family and they will be missed. We will continue to honor their service with the same high quality coverage we have delivered since 1948." "Timing is a gift that those of us in show business take pride in. We believe the time is right," Edwards said. "It's always good to leave before you're asked to do so and for an audience to say 'we're going to miss you.'" "I wanted to go out on top!" Eubanks said. "After so many years of hosting the biggest day of KTLA's TV year, it felt right to say goodbye on great terms. My family is already planning a week AWAY after Christmas next year  a novelty I haven't experienced in thirty-eight years. Also, I am working on a handful of projects that need me available to travel during the busy holiday season." Eubanks, known internationally for his successful career in radio and television, has been a staple of KTLA's Rose Parade broadcast since 1979. Before that, Bob produced the Beatles for all three years they toured in the United States. He also hosted "The Newlywed Game" for many years and, in 2005, received a lifetime achievement Emmy Award from the Academy of Television Arts and Sciences. Bob co-hosted the Rose Parade with Barbara Feldon (Agent 99 from "Get Smart") and Jayne Kennedy ("Body and Soul") before the unforgettable partnership with Stephanie Edwards was born in 1982. Edwards was the first female co-host of the ABC network morning news program that would become "Good Morning America." This opportunity led to several other hosting assignments  including "Leave it to the Women," "Live with Sam (Rubin) and Stephanie," "Everyday" (for which she received an Emmy nomination)," and an 18-year run as the on-air spokesperson for Lucky markets, a national grocery chain. She has also been a prolific speaker for national corporate, women's and church events. "The people of Los Angeles and around the world have sensed  and it is true, that Bob Eubanks and Stephanie Edwards are wonderful people. Together, their wit, rhythm and rapport on screen is legendary, but even more important is their devotion to faith, family and their positive attitude and perseverance in this challenging industry," KTLA Vice President/Station Manager John Moczulski said. "As we watch and enjoy the 2016 Rose Parade it will be with nostalgia and a deep sense of gratitude to both Bob and Steph." KTLA has been broadcasting the Rose Parade since January 1, 1948 and one year (1947) before on experimental station W6XYZ. With the most camera positions and a bird's eye view of the parade on Colorado Boulevard, KTLA has been Southern California's go-to for Rose Parade coverage for 68 years. The tradition will continue Friday, January 1, 2016 with this year's Rose Parade presented by Honda, themed "Find Your Adventure." You can send your best wishes and Rose Parade memories to Bob and Stephanie by email. Source material courtesy of the Pasadena Tournament of Roses.